I've been looking forward to writing this post since the moment I said goodbye to the Amalfi Coast a few weeks ago. Its allure is irresistible— spectacular beaches, gorgeous weather, towering cliffs, charming villages, lush gardens - the list can go on and on. 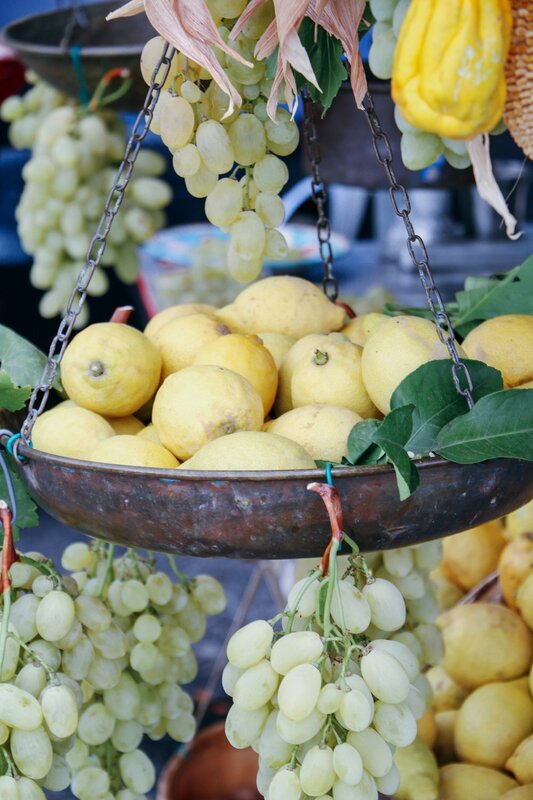 While this entire region of Southern Italy is amazing, the picture-perfect town of Positano may be the crown jewel. A staircase of colorful homes tumbling down to the sea, this once sleepy village has become a haven of chic hotels, fine dining and unique boutiques attracting travelers from across the globe each April through October. I had done some research before arriving as to what restaurants to eat at and of course where to stay, but that was the extent of it, as traveling is all about the experiences you build along the way and I was looking forward to discovering places for ourselves as we strolled the cobblestones streets. And that's exactly what we did! So, while I suggest exploring for yourself, below are my favorite places in Positano that I highly recommend you check out during your trip! Il San Pietro - We decided to stay at Il San Pietro - which may just be the best hotel on the Amalfi Coast, and is a strong contender for any global list - and could not recommend it enough!! Read about our experience here. Le Sirenuse - Another hotel that was on our short list was Le Sirenuse - a family-run, luxury boutique hotel located in the heart of Positano. You can't beat the location and it's home to some of the best restaurants/bars in town! Hotel Villa Franca- The villa was a private home until the family turned it into a boutique hotel, and is filled with designer pieces and thoughtful details, from an Italian film library to vintage board games. Also in a great location on the hill! 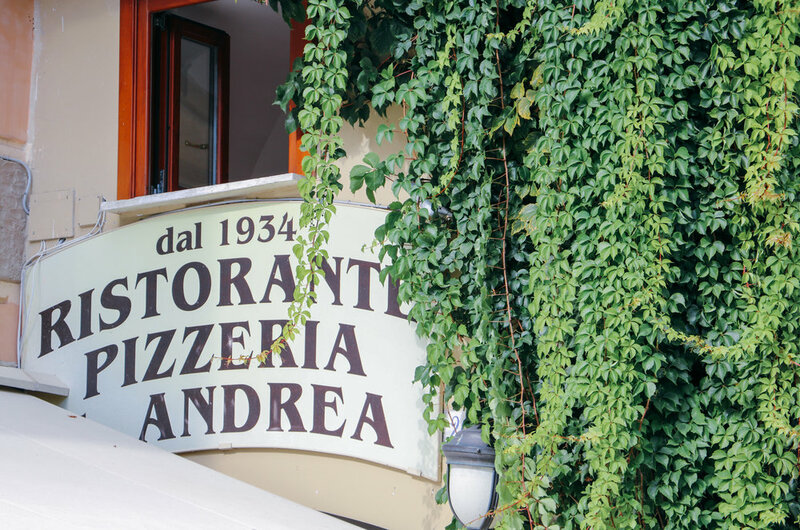 This being Italy, it's hard to find a bad meal but why not go for an exceptional one? Restaurant Bruno - This little restaurant is the perfect spot for lunch because of the location and amazing view! It's situated halfway down the hill with outdoor seating, so you won't have to break from taking in the stunning surroundings. The pasta dish I had was one of my favorite meals the whole trip! Zass - Overlooking Praiano and the coast, Il San Pietro’s Michelin starred restaurant is the place to go if you're looking for a formal dinner with an unforgettable atmosphere. Plus, it's open to non-hotel guests so it's a great opportunity to check out Il San Pietro if you decide to stay somewhere else. Chez Black - Located right on the beach, at first look Chez Black seems a bit touristy, but don't let that steer you away. The food is delicious and once inside, the atmosphere is lively and charming. Greg still talks about the homemade pasta with lobster he ordered! Next2 - We didn't get a chance to try Next2 but we heard really good things about it from locals we met in Positano! It has a romantic setting with modern cuisine that isn't touristy. La Sponda - Another Michelin starred restaurant - this one in Le Sirenuse hotel - is illuminated during dinner by four hundred candles that create an unforgettable atmosphere. Franco's Bar - And make sure to check out Franco's Bar, located next to La Sponda, for champagne and cocktails with a view! Positano is full of boutiques selling local specialties of fine linens, lemon products and colorful ceramics, all which make great souvenirs. I picked up a few things for myself and a handful of gifts, but wish I would have bought more - especially since so many of the shops will ship items home for you! Pepitos - I was determined to find a special linen clothing item for myself and after a few days of looking I stumbled into Pepitos and found the perfect linen dress! The shop was one of the first boutiques in Positano and it's good quality and classic designs have dressed everyone from Liz Taylor to Jackie Onassis. Ceramica Assunta - There's no shortage of shops in Positano selling ceramic goods, but Ceramic Assunta has been in business since 1948 and has two storefronts offering a wide selection of hand painted designs. Plus, they'll ship anywhere in the world, which is good, because some of the prettiest pieces are quite large! Temptation Positano - I'm still kicking myself for not buying a dress or shirt from Temptation! The brand sells the most exquisite outfits using local hand-crafted lace and crochet and has been seen numerous times on Olivia Palermo (so know it's good!). They do run pricey ($300-500 for a dress) but are beautiful! Antica Santoria - A bohemian take on linen beachwear at a better price range. There are a few storefronts throughout town and they're open late. Emporio Sirenuse - The gift shop located in Le Sirenuse hotel sells chic clothes, accessories and homeware all embodying the Amalfi Coast. Fun to walk through even if you aren't looking to buy! Private Boat Ride – We went on one with our hotel, but there are numerous companies who offer rides. They’ll take you along the coast and give you a little history of each town you pass. It's an absolute must to see the coastline from this vantage point! Another option would be to take a boat ride to Capri and visit the famous Blue Grotto. Spend Time at the Beach - The beach at Positano is world famous for a reason! Go to Arienzo Beach Club where you'll find the orange and white umbrellas that you see in all photos of Positano. It'll be crowded but worth the experience. Visit Amalfi and Ravello - Positano is magical, but so are the other towns lining the coast, so make sure to explore them as well! Our hotel arranged a driver to take us to Amalfi and Ravello (both south of Positano), and what we thought would be a quick trip turned out to be one of the highlights! I wish we would have had more time to explore, particularly in Ravello, which is up the mountain and offered the most stunning views. 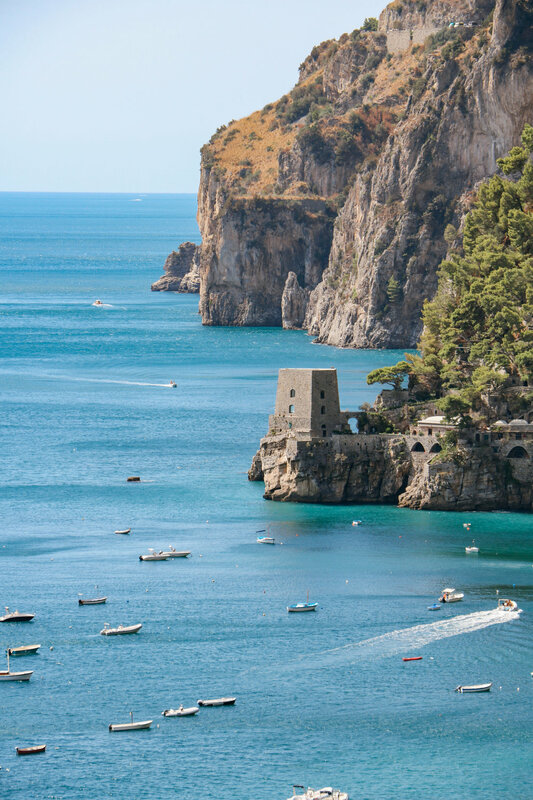 To get to the Amalfi Coast your best bet is to fly into Rome or Naples and take a car from there. We flew into Rome and took a car service that the hotel arranged. It's a 3 hour drive and somewhat pricey, but worth it to not have to worry about catching a train or ferry after an already long day of travel! If you're arriving in Positano by ferry or bus, keep in mind you can hire a porter to carry your luggage to your hotel so you're not struggling to get it up (or down) the hill. Just look for the guys with the porter carts and ask them to deliver your bags. It will be well worth the money (about 10 Euros per bag)! Tipping was something we struggled with the whole trip, as the Italian custom of not tipping is so opposite American culture. If you're unsure what to do, it's always best to leave something, but they do not expect a tip - even at restaurants - in Italy. 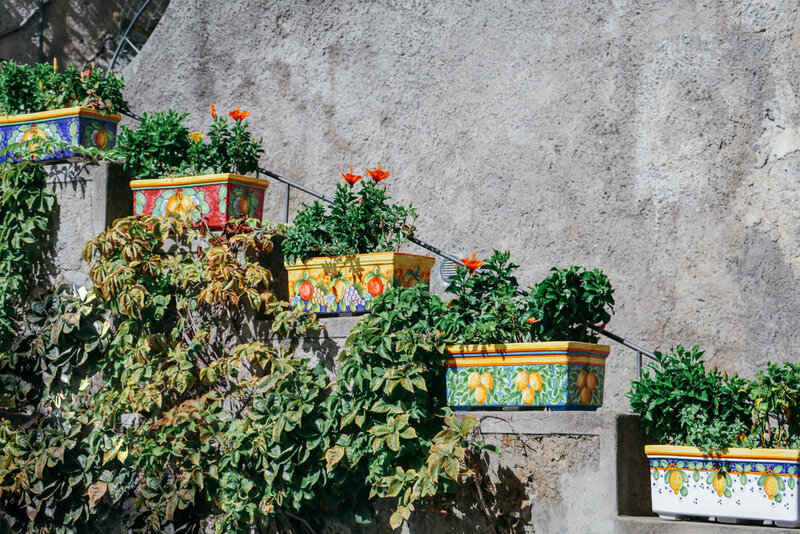 Positano is full of stairs! You'll be walking all day, so make sure to pack comfortable shoes. The good news is, you'll be walking off all the delicious food you'll be eating! High season is June - August, so you may want to consider visiting in May or September when crowds are a little thinner and hotel prices are slightly cheaper. We loved being there in September as the temperature was in the mid 70’s and low 80’s instead of humid and in the 90’s!